This souvenir building replica has always been a favorite of mine. 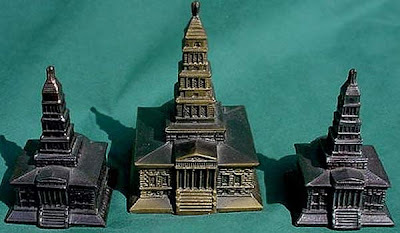 The copper-colored pot metal miniature stands four inches tall and is nicely detailed. These were most likely made in the 1960‘s and can still be found out and about, but no replicas are currently for sale at the memorial’s small gift shop. Recently, I took the time to take a tour of the memorial and learn more about it. The real building is a landmark in Alexandria, Virginia and sits atop a hill overlooking ‘old town’ and the Potomac River. Its main purpose of the Masonic Memorial is honoring and perpetuating the memory and character of George Washington who was a mason. Freemasonry was already old when a young George Washington became a member of the Fredericksburg, Va lodge in 1752. He remained a proud member and patron of “The Craft” – as Freemasonry is also called – his entire life. 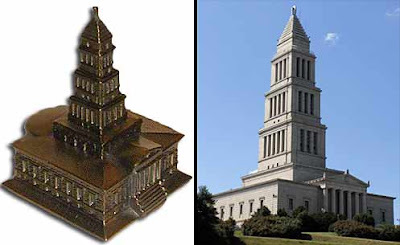 The George Washington Masonic Memorial is a museum, tourist attraction, research center, library, center for community activities, performing arts center, concert hall, banquet and celebration site, and a host location for visiting lodges. The Memorial’s mission is to educate and promote the virtues, character and vision of George Washington, the Man, the Mason and Father for Our Country. The Memorial also preserves American Masonic history and informs the public about Masonic affiliated and auxiliary organizations and charities. The Alexandria Masonic Lodge, to which Washington also belonged, began receiving objects from Washington’s family and associates soon after Mrs. Washington’s death in 1802. Desiring a suitable and fireproof Memorial for the Washington artifacts, the Grand Master of Masons in Virginia invited the Grand Lodges from around the country to gather in Alexandria on Washington’s birthday - February 22, 1910. The Memorial Association was formed, construction began in 1923 and the Memorial was dedicated in 1932 which was the bicentennial of Washington’s birth. Influenced by the classical architecture of Greece and Rome, the Memorial’s entrance is inspired by the Parthenon of Athens. The three sections of the tower rise in ascending levels of complexity with Doric columns at the lowest, Ionic in the middle, and Corinthian for the top section. The tower is capped with an Egyptian Pyramid, and surmounted with a stylized flame-like finial as a reference to the ancient lighthouses of Alexandria, Egypt. The Memorial is also the lighthouse of Freemasonry, spreading the light and knowledge of the fraturnatiy to the world. The top is an observation deck which provides a panoramic view of Alexandria, Washington, D.C. and the surrounding area. Check out this Virtual tour of the memorial. Do you know of other versions of this Masonic Memorial? Let us know via the ‘comments’ link below. I know of at least 3 different pot metal sizes that are in my collection. Those with the plaster versions they last sold in the gift shop a few years back. Wish I had bought an 8". Never did see that one.